1. Select the loaf size on your bread machine if applicable. This recipe will make a one and half pound loaf of yummy fantastic bread. 2. Add the the first seven ingredients (buttermilk, oil, brown sugar, caraway seeds, salts, flours, and yeast) to your bread machine baking pan in the order the manufacturer recommends for your brand of bread maker. It does make a difference! I can’t tell you how many failures I had when I got my new bread machine because I loaded the ingredients in the same order as my old bread machine. Once I double checked the instruction manual and followed the recommended ingredient order for the new machine my bread came out perfectly. Read your machine’s instructions. Don’t be that guy! 3. 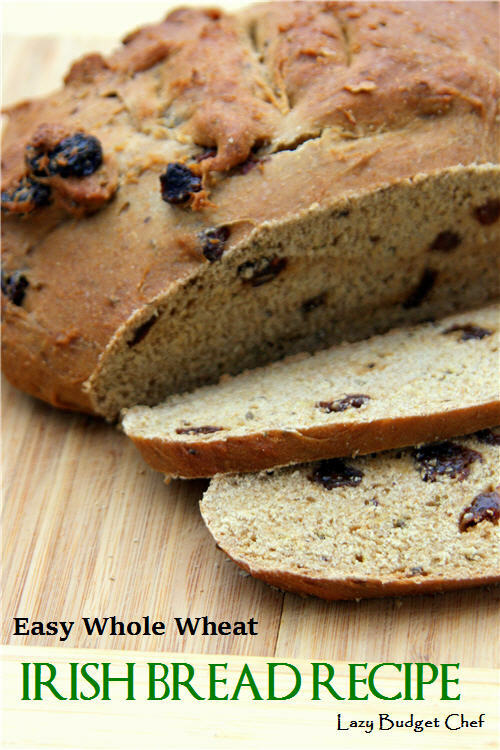 Add the raisins the bread maker to the bread maker per the manufacturer’s instructions. Some machines have a little hopper that dispenses it for you during the baking cycle. Other bread machines beep at the point you need to add dried fruit manually during the baking cycle. 4. Select the Dough option and start the bread machine. 5. Transfer the finished dough to a greased pie plate to keep the bread round while it is baking in the oven. 6. Bake the bread dough in a 375 degree (F ) oven for 30 minutes. 7. All the bread to cool, slice, eat, and repeat! Don't have a bread machine? Check out the following easy Irish soda bread options - and more! - below! I am so intimidated by homemade bread, but it always looks worth the hassle. Thanks for sharing at Fiesta Friday! Yummy! We make fresh bread once or twice a week and this recipe sounds great. I might add a sprinkling of cinnamon or mixed spice to go with the raisins too! Thanks for sharing at Fiesta Friday! This looks delicious! After a trip to Ireland, I came back with a serious addiction to the bread - glad I can now make it here and it's easy! It sounds wonderful. I do have a bread machine, so I can't wait to try this recipe.